If you are like me, the acronym SEO brings a shudder to your bones. If you are a photographer with a website, you have no doubt received countless emails from sites offering to optimize your site for a fee. In this post, I will tell you the things I did for free or next to nothing that helped push my photography website to page one of organic Google searches. The one thing that I already had working to my advantage is that my website is a non-flash site that was launched almost seven years ago. Though Search Engine Optimization is a very controversial topic, everyone can agree that the best thing anyone can do is post regular, original content. The next step would be pointing traffic to your site from good sources, such as industry blogs. This isn't the end all be all though. I already had more than 600 external sites that were linking back to me (I was able to check this by using Google Webmaster Tools), but none of them really helped me because my site was severely lacking in keywords, meta date, page headings and alt image tags. So my seven year-old, non-flash website was only showing up on page four on some keyword searches and seven or eight on others. Keep in mind that while optimizing your site will absolutely help you rise in organic searches, the pace will be determined by several factors, including the age of your site. 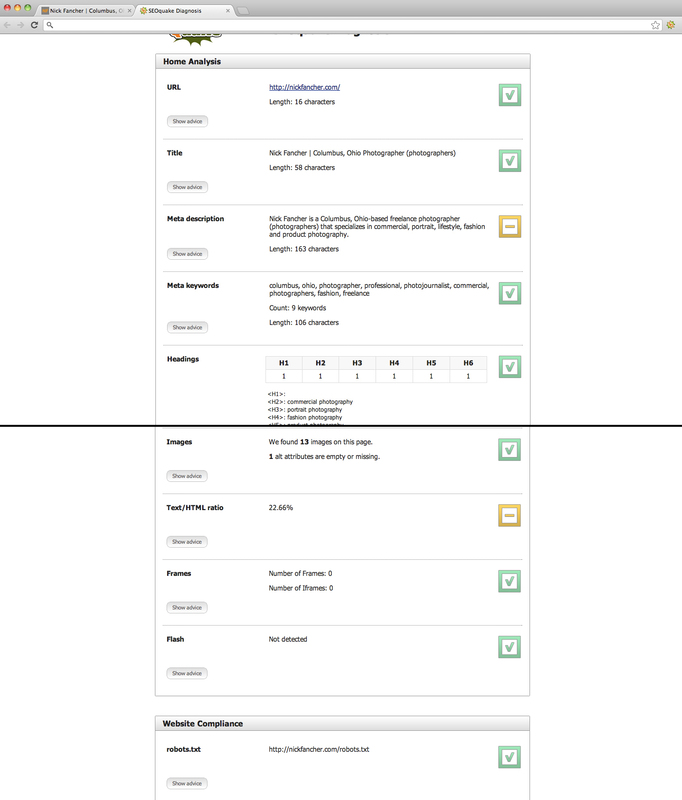 Without further ado, here are the steps that I took in optimizing my website for $350. The first step you need to take is to download SEOquake. This is a free plug-in for Chrome and Mozilla that allows you to see websites the way search engines see them. For example, search engines DO NOT like flash-based websites. They DO like alt tags on images, meta keywords and short, succinct descriptions. With this tool, you can also browse what keywords and descriptions your top-ranking competitors are using. The Page Info tab shows your site ranking throughout the country/world. 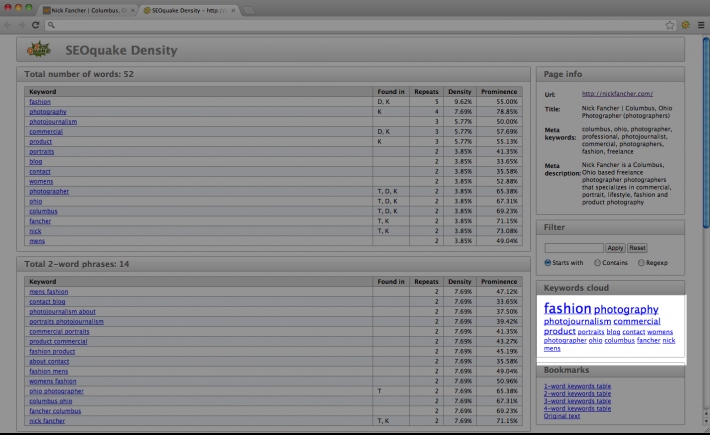 The Keyword Density tab shows you the words most commonly found on your website. For example, the most used word on my website--combining headings, meta data and keywords--is fashion, followed by photography and then photojournalism. But before I had optimized my site, the word photography wasn't even present. Instead there was a bunch of weird filler text and gibberish. 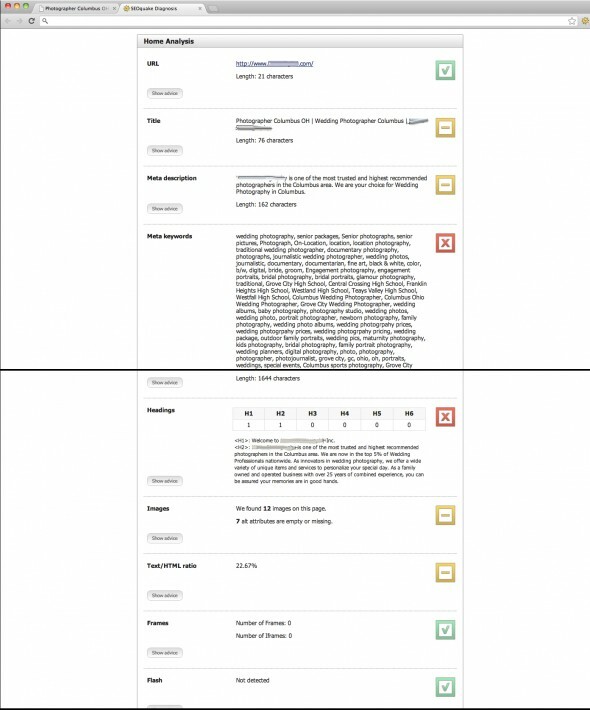 The Analysis tab gives you an overall summary for how your page tests according to search engine standards. If you are using too many words in your meta data, you get a red "x". If your URL is short and succinct, you get a green check-mark. If it is a decent description, but maybe a bit too short or long, you will get a yellow dash. Above is a picture of my site report after optimization. Below is a report of one of my competitors, who currently ranks on page four with organic searches. Notice that while they are using good keywords, there are far too many. Search engines often consider these to be spammy sites and will often penalize their overall ranking. Also note that they have poorly titled headings and seven missing alt image tags. Once you have pinpointed the areas of your site that need built up, you need to optimize it. This is easier for some people than others, depending on your tech knowledge as well as the type of website you have. For example, I am by no means a tech guy, but I was able to do some of the optimizing myself. I have a Squarespace website, which has clearly labeled sections for meta data, site description, header titles and code embedding. What they don't have is the ability to enter alt image tags. I have no idea why. So I had to cheat a bit. I had to paste some alt image tags in the coding (even though they don't relate to any particular image on my website) in order to satisfy this area of my optimization. 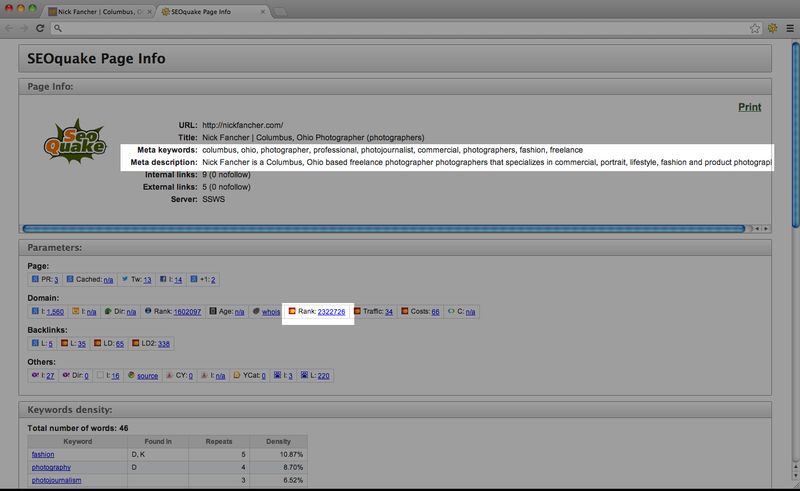 Wordpress does, however, have a spot for alt image tags. If you are completely lacking in the technical arena, find someone that knows coding and ask them to help optimize your site, according to the SEOquake summary. I paid a guy $100 to do this for all three of my websites--it took him an hour to do it. While Google AdWords charges an arm and a leg to advertise with them, their tools are free to use. And they are some powerful tools. Once you create an AdWords account, use the "find keyword" tool to discover which local and national keyword combinations are the most popular. It will even tell you how strong the competition is for certain phrases. If your site is a newer one, it may take longer to climb in ranking under certain phrases. 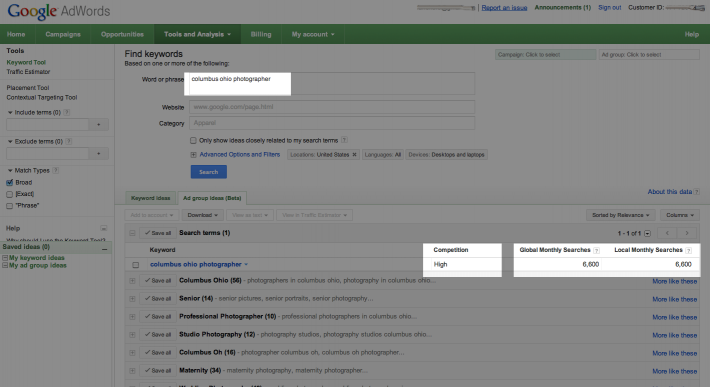 It is good to identify keyword combinations that are less competitive, but still relevant to your style of photography. It is extremely important to consider what types of visitors certain keywords bring you. For example, even if your website were to show up as a top-ranking entry with the broad search of "photographers", you would almost certainly find that it's not a paying client using those search terms. 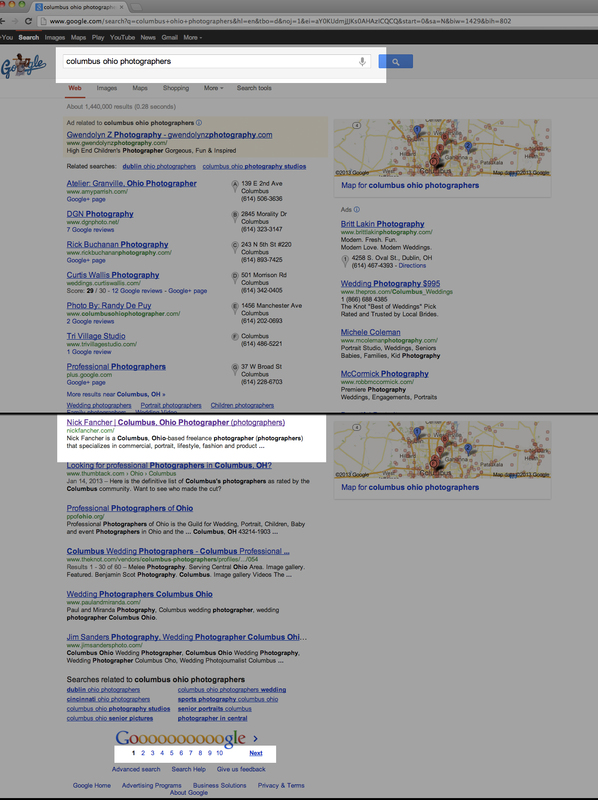 A potential client will more likely use a search like "Columbus, Ohio photographers" or "Portrait studio Columbus, Ohio". So these are the search terms where you want top listing. Now that you have determined what keyword phrases you want to conquer, you need search engines to see these words from multiple sources, in association with your site. This means link building. 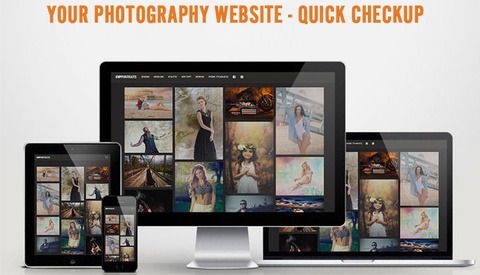 If you are already a web-savvy photographer, you may have a number of industry blogs or businesses linking to your site. That's great. 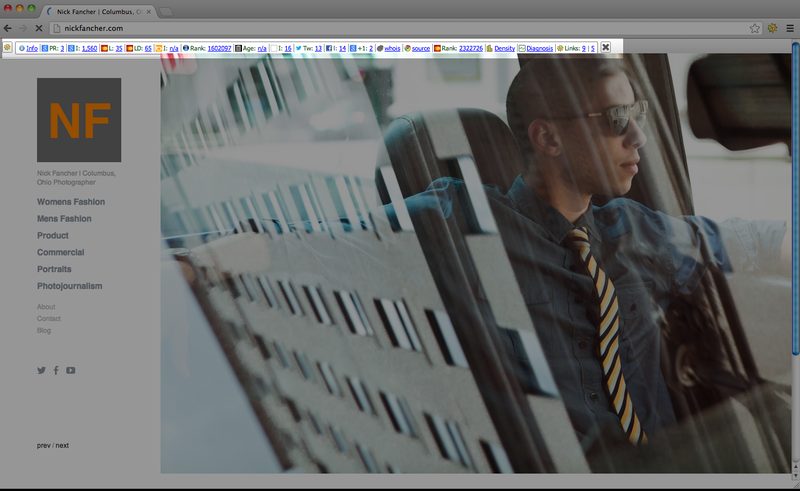 It's even better if their link includes some of your desired keywords, as in "Columbus, Ohio Photographer Nick Fancher". But even if you don't have many external sites linking to you, all is not lost. This next bit of advice is especially controversial. Even though I had plenty of sites linking back to me, I wanted to associate certain rich keywords to my website. I did this by using Freelancer.com. 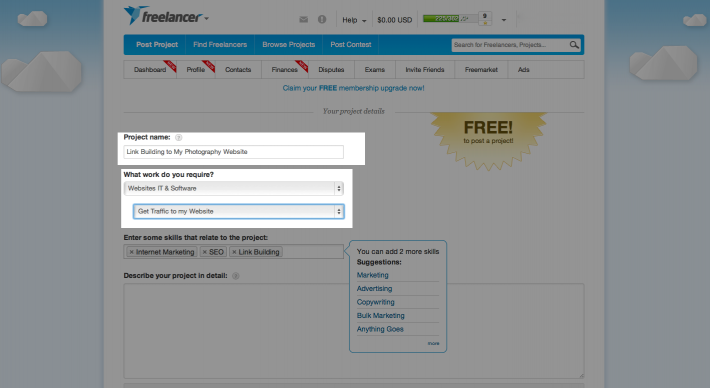 Freelancer.com is a site that lets you post jobs such as "Link Builder Needed for my Photography Website" and reach freelancers from around the world. For my optimization campaign, I decided that I didn't want to spend more than $250 on link building. I set this as the max price in the parameters of my post and waited for the bids to roll in. I then selected the best offer from the highest ranked bidder. I gave them a list of the keywords that I wanted to dominate with, including the more competitive "Columbus, Ohio Photographer" as well as less competitive phrases like "apparel photographer". After I accepted their conditions (for me it meant 200 links from high traffic websites for the quoted price), I transferred my money into Freelancer.com's escrow account. Once the link building was complete, I received a description of the URLs that are now linking back to my site, and I released the funds to the freelancer. After following these four steps, my site rose to page one within two weeks. Naysayers will say that link building will get you nailed by Google as being spammy activity, but it worked for me. Before using Freelancer.com, I didn't have the word "apparel" anywhere on my site. After my campaign a few weeks ago I am now ranked on page three for national searches with the phrase "apparel photographer". Again, your success rate will vary, depending on the age of your site and the competition surrounding your keywords. I do want to include a counter argument from FStopper Tam Nguyen. In his words, "buying links is the express lane to being marked as spam on Google. Optimizing your website is good though. Meta tags and auto-generated content like sidebar and meta tags are no longer used to rank/index. Google pays a lot more attention to content nowadays. In fact, if you just throw out keywords without incorporating them in written paragraphs, Google will consider it as spamming. Watching Matt Cutts' videos on GWT could probably help steer readers in the right direction. He talks about link building, content, and the importance of having fresh and original content. 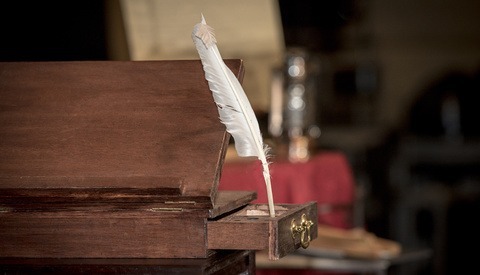 I've said it a few times, and I'll say it again: if I were asked to give only one piece of SEO advice, it'd be this: keep creating fresh (meaning frequent and up-to-date) and original (meaning no copy, no repost) content, and Google will take care of the rest. Obviously stuff like post titles and URL and other stuff help too, but it won't be a be-all-and-end-all solution. As for keywords and tags, they can't be auto generated. You have to incorporate keywords IN your content. Not only does Google index links and titles, but they now also index the context around such links and keywords, so you can't take it lightly." Doing this can actually hurt your website. It may work in the immediate future but eventually it will rank against your site. Google is smart enough to pick out "link farms" and those link backs will never help you as much as real links from highly ranked sites. Google somehow can rate website content with out going links and rank it accordingly. Therefore, an out going link to say "Charleston Wedding Photographer" on Fstoppers.com will not be as effective as the same keyword linked off of a site like WeddingWire or TheKnot because Fstoppers isn't a wedding based website. Fstoppers is a photography blog so it counts for something but a site like Craigslist.org or Dell.com would be pretty useless for wedding SEO even though those sites are huge. Like Nick said above, it might help in the short term but if those posts ever get deleted (they will cause they are job offers) or someone alerts Google to your blackhat practices then you can get penalized rather quickly and indefinitely. The best route is to either write full articles on your own blog and build that up with tons of content OR get legit articles published on other big sites of your genre and then kindly ask them to hyper link specific keywords back to your site. I give a quick breakdown of how I approach SEO in our How To Become A Commercial Wedding Photographer download. Keep in mind, these days ranking at the top of Google for keywords still isn't the best option. Lee Morris owns Charlestonweddingphotography.com which ranks #1 on google for one of the best set of keywords (Charleston Wedding Photography) and it does not get as much traffic organically as you would think. This is mainly because being #1 on google still means you are probably listed #5 after you consider Google Ads and Google Places which are pushed to the top. People have a hard time swallowing the fact of advertising on google for clicks but both Lee and I get WAY more clicks to our sites through Google Ads than from being ranked high up on Google organically. Of course diversifying is the name of the game so you want a little of everything to work for you. Patrick, I did learn quite a bit about SEO watching that DVD. You guys included lots of great tips in there. Nick, thanks for sharing the SEOQuake plugin. Looks super interesting. I plan on giving it a go. Thanks for the reply. That's exactly what i meant to say. For one part working with SEOQuake might be worthwhile (for someone as myself who doesn't know anything about SEO yet). But i think the second practice should really not be advertised anywhere as i think it gives a wrong impression on how to generate traffic for your site. I'm just starting my own photography website and am very interested in how i can SEO the crap out of it :p but not this way. I find it even more difficult if, like in my case, you cannot use your full name or your name +photography as a domain name because it is so widespread that all good domains have already been registered. Have you looked into these monthly payment options with paypal yet? I use patrickhallweddings.com as my main URL but honestly, it might not even be the best SEO name to have. Most brides don't necessarily know me and therefore aren't googling me. A good Domain name can be hard to find these days but something like TheCharlestonWeddingPhotographer.com or AnotherWeddingPhotographerInCharleston.com could be better choices if you don't mind the slightly goofy URL name. Keywords are key but so is branding and memorability so consider everything when picking out a name. I haven't personally looking into the payment plan option. I'll have to see if Lee has. Seems like it could get tricky if we had to refund money or something and someone has paid 2/3 of it. I would just try to save up a little each week until you have the full amount but I personally like to pay upfront for things and not use "credit"
Meta Keywords and Descriptions are not relevant as before for google, it doesn't hurt to put it, but it will not help that much. What it really helps is to have a site where the html is well written, clean, optimized and compressed (for example in php there is a function "ob_start( ob_gzhandler )" that compress the page from the server side) as much as possible. Developers (like me) also use the Page Speed plugin for Firebug to check how fast is the page, which nowadays is really relevant for google. Don't underestimate the description meta. On a text-light site (as most photographer sites tend to be), the description is what will show up below the page title in the results listing when you don't have matching text on the page. A good description means that your results listing isn't a generic blind link. That gets user clicks, and user clicks (tracked by default now, although a small percentage of users have installed browser plugins to remove the tracking URL conversions) are as important a part of your page's ranking as anything else. And while the keywords meta isn't directly used for indexing, the correspondence between keywords and content does affect the "trustworthiness" rating of a page, and if that rates high as a site average, keywords will be indexed. It's not that the meta no longer works, it's that misuse of the meta is more often accurately identified and punished, so if you do it wrong you'd have been better off not doing it. does a tumblr site allow me to use ALT tags for images? IS Tumblr even a good option to use as a "professional portfolio" page? I have been designing one on there and would love some feedback. www.brandenhughes.tumblr.com I plan on getting a domain to remove the ".tumblr"
And why is that @alessiomichelini:disqus ? Because it's very limited in options, it looks and feels extremely cheap, and that's certainly something you don't want for a professional purpose. I had to go through http://www.thatwerks.com tonight to do some optimizing and this article really came in quite handy. Kudos for all these examples. Badly it's more than you say... SEO is a ongoing topic with ~major changes half a year. You can buy links but when you do, please don't do it on those link-farms! Also don't link directly to your domain. Use keywords and deeplinks. Also in this article the word wdf*p*idf was never appeared. Just do some onpage optimization and let the links come by itself or ask someone who is a professional in it. You can ruin so much by having the wrong link profile. There are all so many on the web, jockeying for better placement. Brave move there Nick. Any of your competitors who want your site penalized now have a reference to point Google to for proving you buy links. 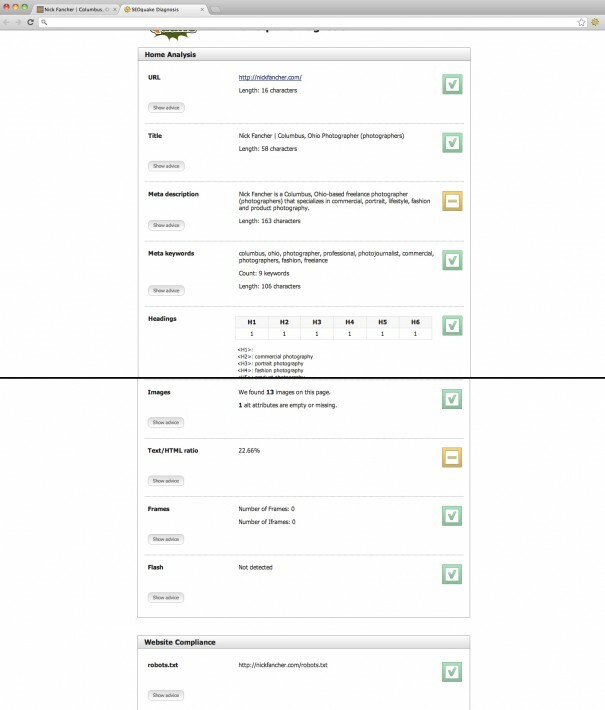 If your site comes up for a manual review you have no comeback as far as google is concerned. You buy links you're in for a penalty. I imagine your site has got a decent link profile (I haven't checked) already so to Google those spammy links probably dilute quite well and have given you the boost for the keywords you want. But your good links are what give you the ability to pull this off. Personally I would have got them going to a page talking about the keywords they reference. Within the SEO industry it's openly known that people buy/swap links. Some do it directly some may think of more creative ways to get a link from another site. If you do buy links I really wouldn't shout about it and I really, really wouldn't place a list of sites you've bought links from on a website. Those links will be mute soon. I think rule number one for photographers wanting a SEO boost is make sure you have relevant text on your site. Google search are (mostly) text based. Google doesn't know that that picture on your site is a picture of food that you took in your local town. Alt tags, descriptions, blog posts pointing to it all give these textual hints that Google needs. BTW meta keywords mean nothing. 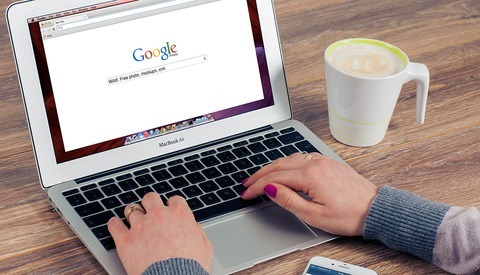 Meta descriptions don't help you rank but are your free advert on Google - concentrate on making them inviting. SEO is marketing, though with a heavy slant towards pleasing google. If you lean on any one of Google's weaknesses too heavily eventually they'll kick back and your site will suffer from it. Thanks for the comment. What about disavowing harmful sites that are linking to me? Isn't that an easy fix if I get penalized? Disavowing links is more for if someone has launched a negative campaign against you. If you do get a penalty it'll more likely because you're buying links, and promoting it. I think it's best just to sit and watch your rankings. If your apparel listings drop then I think you'll just have to take it. If you get a broader site wide penalty then you'll have to hold your hands up and say sorry to google. Unfortunately this bit isn't so transparant. It's up to Google what they deem right - judge, jury and executioner. But you have a good site with good content so that's a very good start. Site's always shift around in the rankings especially for longer tail stuff so don't assume a drop is a penalty straight away. It seems you don't link to your main site from your blog much. Perhaps try and write a few more wordy posts mentioning the keywords your going for then link to your main site, preferably to a specific page that's relevant. On a side note I find the tumbler theme you have a little hard to navigate. Clicking on the more button don't change the url so it's hard to link to specific posts. Making things easier to link to can result in more links. I.e Nick Francher has a great tutorial on linking leather apparel -&gt; link to post. If it's difficult people wont do it. Anyway I'm sure I've gone on long enough. Good luck with the improvements to the site and I hope you get the clients you're after. Thank you for your input. Really helpful advice. Nice Blog. I appreciate it. It is ever changing field. You've got to keep self updated. I want to shout from the roof tops a giant THANK YOU for this article. I started this SEO journey with little to no knowledge of what SEO even was and this article helped me tremendously. I have a lot more studying to do on the topic but at least I am now have a good grasp of what I am dealing with. Again, thank you thank you! Using a freelancer to build back links for you was very very brave - they could have hosed your site if they had done it incorrectly. Fortunately you lucked out - if anyone does go down this route always ensure you give clear instructions on what keywords they must use - with the recent Google algorithm changes keyword diversity is the most important factor. Don't just back link with your main keyword. Use lots of variations, including your brand name, and generic link texts like "click here", "this site" etc. Your back link building needs to look natural. Spread it over a period of time as well. hi First of all, you got the points together. SEO is evolving each month and we all need to update our selves with the trends. I would restrict myself to key word research, that's my favorite topic. 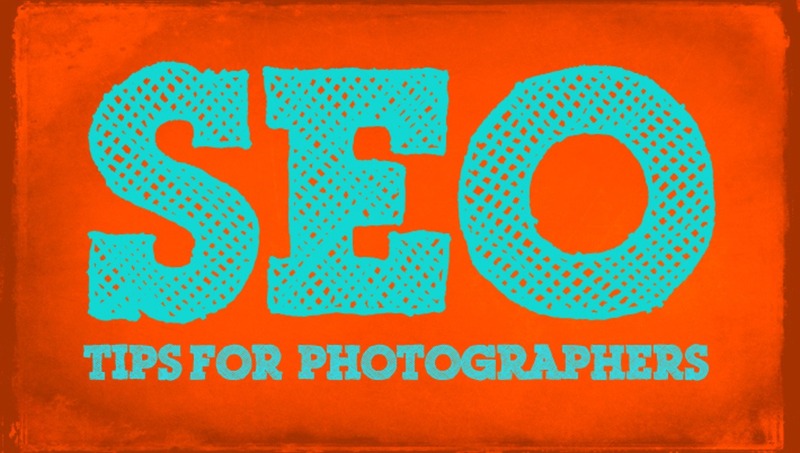 SEook O's or Photographers who are looking at seo for their business, should be sure of choosing the right key word. If you aim for a high competition key word, it will take ages to rank and if you choose for very specific key word, which only person known to you will search, then you will rank easily but no benefit. "Portrait photographers near Point Cook Melbourne" is a good example of a long tail key word and the one which can be ranked for. What you think of those other guys (photographers) showing above you? You think its worth paying to show on the top of the page before actual results show up?